Must-Haves for a Quick Weekend Getaway! Summer is short but since many can’t take the time off to travel, weekends are to be cherished! They are the best time to get away and leave the buzz of the city behind. Sometimes, these quick trips are spontaneous –leaving you with little time to pack. Not to mention, you’re only on the go for two to three days. So what should you stow away in your overnight bag? 1. Dry Shampoo: Let’s face it –this season is all about frizz, humidity, and fussy hair. But while you’re away from home and on the go, quick showers throughout the day aren’t always an option. So when you need a mid-day refresher, spay on some dry shampoo and you will be set for whatever your agenda has in store –lounging on a lawn chair included! 2. Tinted SPF balm: Rosy lips or sun protection? Now you can have both and save some space in your bag for those sandals you really want to bring along! Buy a tinted lip balm that also has SPF( minimum 15). That way, you have great hydration throughout the day, stay away from sunburn, and have a great lip tint for the evening –all in one. 3. Double Duty Clutch: When space is limited, try to use your items for more than one purpose. Example? 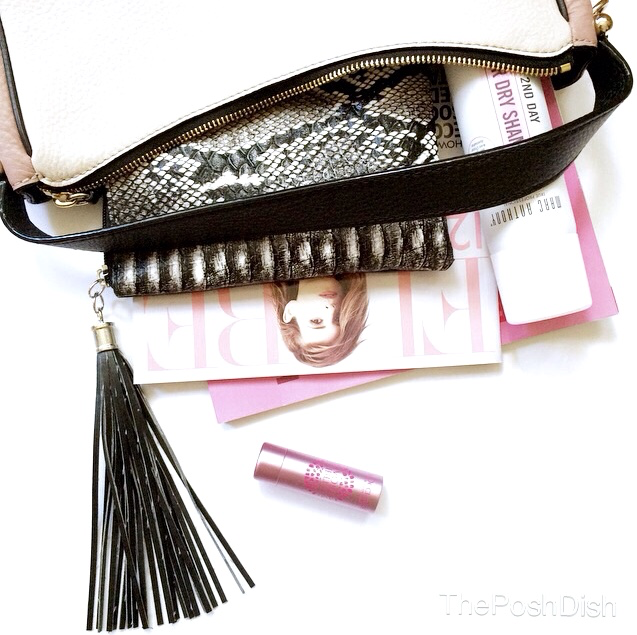 Why not turn your clutch or small bag into a make-up bag! Let it hold your make up as you’re in transit, lay out all products on the bathroom counter at your destination, and use the bag/clutch for evenings out. 4.Make room for Magazines: Whether getting to your destination takes a few hours, or all you’ll be doing is lounging on the shores of a lake, magazines are a must to help pass the time. Bring a few of the latest issues on your trip and catch up on your favourite fashion trends or topic of interest! So kick back, relax, and worry about which cool drink to sip on next rather than the packing!